**I’m actually German but whatever. I’m just taking a moment to post about some Alfas I got recently. I have no harsh feelings for //May, I just have no BMWs to show off at the moment. First up is this 1:43 159 saloon from Bburago. 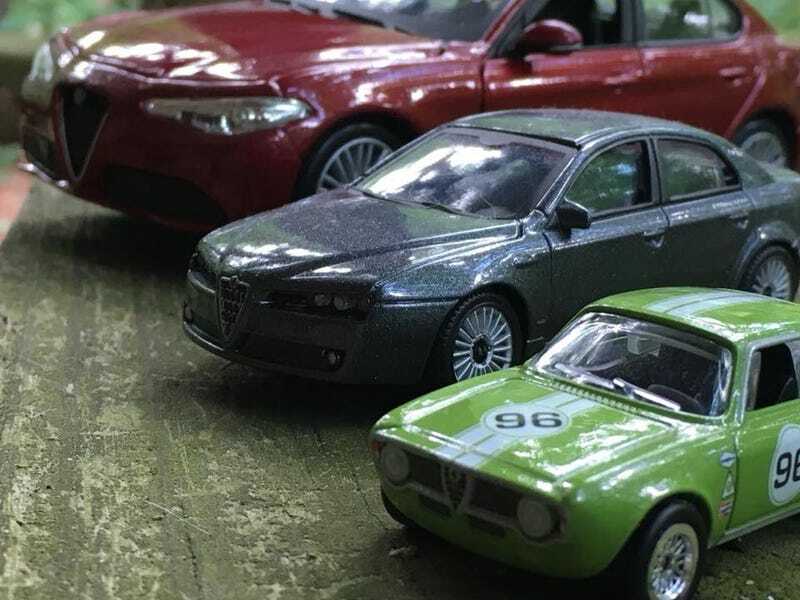 I was conversing with BlueMazda2 about 159 models one day as I’m trying to expand my Alfa collection and he turned me onto these units that were sold by Bburago, but actually designed and built by a different supplier that I don’t know the name of. I’ve always been fairly skeptic about Bburago models smaller than 1:24 scale, as their quality in the larger scales is sometimes lacking, and I feared that they would only get worse in smaller scales. Plus I’ve never been a fan of the cheap off-model wheels they always use, which is why I never sought out any of the 1:43 Ferrari models until recently. However, the 159 here has me pleasantly surprised. The cast is pretty brilliant, it’s a really solid build with good detailing, embedded in a nice and glittery Grigio Stromboli finish. The wheels may not be 100% accurate to the real thing, but they’re at least a deep dish design with real rubber tires. Very nice indeed. I’m very impressed with this little 159 and happy that I paid the price to have it shipped from Italy. It makes a fine addition to my collection, and now I want more. Next is the new Hot Wheels Eurospeed Car Culture Alfa Giulia GTA Sprint. I’m already a huge fan of this cast. It’s got good detail for the side and looks good in pretty much any color it ever comes in. My favorite has to be the version we got for the Forza line, but I’m definitely digging this light green livery we have here. Everything about this little guy is tasty, from the wide hips and fat tires to the detailing in the front grille and rear fascia. The only downside to this version is those BBS-lookalike mesh wheels, which I don’t think are the best pick for this car. Bring back the Panasport-lookalikes please. But, man, that livery is great. It’s simple and classic, just as it should be. I’m definitely a fan of the Alfa Romeo badging and Quadrifoglio badging, all brought forth with some excellent detail that we’ve come to expect from the Car culture line. I can’t really say much that hasn’t already been said about this cast, it’s just amazing for Hot Wheels to produce such a flawless rendition of one of my favorite classics. A true gem indeed. Anyway, I think that calls it for this one. I’ve already done an entire article on that 1:24 Giulia Ti, I just added it for some extra flair to this Italian duo. Anyway, back to your regularly scheduled BMW content, I just felt it’s fair to throw something with a bit more style into the mix.